I Wish You a Merry QAL Block #6 Release! | Sparkle On! I Wish You a Merry QAL Block #6 Release! Block #6 “Hanging Stars Angel block” is brought to you by the talented Sandra Healy of Sandra Healy Designs, where you will find the complete block pattern and tutorial. I used a Sharpie pen to trace the templates on the fusible web so it won’t bleed through to the fabric when ironing. Pencil is also a good choice. I used Heat n Bond Lite to fuse the pieces to the background fabric. I always like the results I get when I use it. I used a stabilizer. I don’t have much experience with stabilizers and decided to try Pellon Cut Away. I like this better than the tear away I tried on another project. I am curious to know what type you prefer for what type of applique? I have never used sparkily thread before (gasp!) but decided it would be perfect for my Angel. Metallic thread has a reputation for being a bit tricky. Once I picked a needle with an opening that the thread easily fed through, the problem with it bunching up in the needle and breaking was resolved. Instead of a button, I embroidered a little heart for her coif. It has been many years since I’ve embroidered and making the French knots eyes was a challenge until I watched this short tutorial on youtube and then voila, it was just like riding a bike! Even if you don’t need this tutorial, I recommend viewing because I think you will get a kick out of her manicure! 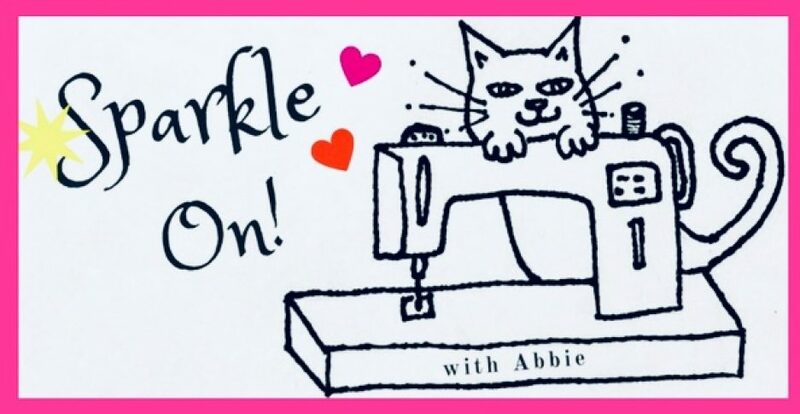 Sandra also has written a comprehensive guide for all things machine applique that you can also find on her blog; How to Machine Applique. The prize for Block #6 includes a small fat quarter bundle from the “Blushing Blooms” collection from Island Batik and a PDF pattern of your choice from featured designer Sandra Healy’s shop. Also, Sandra is offering a 20% discount valid until midnight October 25th using the code MERRYQAL20 on her website shop only ( not valid on her Craftsy or Etsy stores). Entries are limited to one per person and the winner will receive both prizes! This block’s giveaway starts at 12:00 AM EDT September 26th and runs through 11:59 PM October 9th. The winner will be announced on the I Wish You a Merry Quilt-a-Long Facebook page where you can see so many variations of each block as they are released and meet your fellow QAL participants! *On October 10th two mystery blocks, #7 and #8, will be revealed! < Previous I Wish You a Merry QAL Block #5 Release! I like how you added some details to the angel’s dress with your sparkly thread. Beautiful! Yes, metallic thread does have a reputation! But you found the proper cure-all–the right needle! Your version is go wonderfully sparkly! No surprise there. Now that I have some sparkly thread experience, I think I made add some to your block too. This block is so cute! I may have to make more than one! Very pretty! Enjoy your day! Thank you! And enjoy your’s too! Such a pretty, sparkly Angel!! Great job:). I feel like I’m getting ready to fly off the ground with excitement until I find the time to start mine:)! I like the details you added with your stitching. I look forward to making this block. Thanks so much! I look forward to seeing yours. The metallic thread embellishments worked so well on your beautiful angel, it was a great idea! Super sparkly! Your angel is so cute! I love all of the different fabrics you used. Now I’m off to check out that youtube tutorial. Thank you Bobbi! Tutorial lady’s nails are a hoot! Thanks for the link to the you tube video for French knots. I sure could have used that. I had no problems making the first one but the second took me about 10 tries. You angel looks so sweet and serene. Thank you Karen! We had the same French knot experience! I love the sparkly thread!!! it’s so beautiful!